Providing security for both the AD100PRO and the customer is a high priority. Advanced Diagnostics security is similar to that used by the banking industry, i.e. Requires the user to enter a response code on the AD100PRO during the programming procedure. This response code is generated via a smartcard & calculator. Alternatively, try the AD Smartcard APP - by downloading from the Apple Store or the Google Play Store for Android devices. The portable AD100 Pro key programming tool programs keys and remotes for all makes of vehicles worldwide, and provides auto locksmiths and garages the ability to offer an alternative key programming service for drivers on the roadside, at home or the office. The use of transponder technology in vehicle keys means that whenever additional / replacement keys or remotes are required, these keys must be programmed into the vehicle using specialist diagnostic equipment. Originally, if a customer needed additional or replacement keys / remotes, they would have no option but to go to the franchised dealer - which could be expensive and inconvenient. 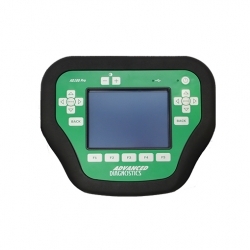 The AD100 Pro is the market leading tool covering over 60 car manufacturers worldwide. Designed and manufactured in the UK by Advanced Diagnostics, the AD100 Pro is a favorite choice for auto locksmiths & auto technicians worldwide - and can generate an excellent return on investment - providing your business a lucrative additional income stream. Designed with simplicity in mind, AD100 Pro simply guides you through various steps for programming keys and remotes and it can also program proximity (keyless Start) and smart keys. Some immobiliser systems require a security access pin code to allow keys / remotes to be programmed. The AD100 Pro can read many of these PIN codes and where they cannot be read - Advanced Diagnostics offer a web service to customers to obtain PIN codes. Providing a high quality, cost effective and valuable service for drivers has never been easier as the AD100 Pro enables locksmiths and garage owners to gain access to leading edge technology at a competitive cost. Advanced Diagnostics develop and supply software modules for use on the AD100 Pro covering most car manufacturers worldwide. The software modules can be purchased as required and downloaded easily direct on to the programming tool via the AD Loader program 24hrs a day. Advanced Diagnostics are pioneers and a trusted name in the key programming market with over 10 years experience. Previously, drivers had to book and arrange recovery of their car to a dealership for key programming, now you can be part of this exciting & lucrative market too by offering key programming services to drivers.